Fujisawa Hideyuki (藤沢秀行, Fujisawa Shuko, 19 June 1925 - 8 May 2009) was a Japanese, professional 9-dan. He was the father of Fujisawa Kazunari, grandfather of Fujisawa Rina, uncle of Fujisawa Hosai and teacher of Abe Yoshiteru, Mimura Tomoyasu, Kurahashi Masayuki, Fujisawa Kazunari, Amano Masafumi, Takao Shinji and Nakazawa Ayako. Fujisawa Hideyuki was born in Yokohama, Japan. As part of the "Three crows," he was one of the best players of his generation, along with Toshiro Yamabe and Suzuki Keizo (and later Kajiwara Takeo). Despite his controversial acts, such as a excessive drinking and gambling, he played go at the highest levels when the times came. Aside from go, he was also known as a successful real estate dealer and calligrapher, having had several of his calligraphy works exhibited. Over the years he became known as "Shuko", an alternative reading of the characters for his given name. However, in his autobiography he stated that although he didn't mind being called Shuko, he still preferred his original name, Hideyuki. Fujisawa, a student of Fukuda Masayoshi, began studying at the Nihon Kiin in 1934 and turned pro in 1940. However, it wasn't until the early 1960s that he began his title runs. His success would continue through the early 1990s, winning the 40th Oza at the age of 66. 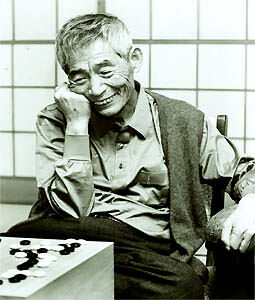 His first major title was won in 1962, the Meijin. He then won two Asahi Pro Best Ten titles in 1965 and 1968. He held the Oza for three consecutive years from 1967 to 1969. The same year that he lost the Oza, he won the NHK Cup. The Meijin title was Fujisawa's again in 1970, and then went on a half-decade dry streak. In 1975, he won again with the 1st Tengen. Then in 1977 he began one of his crowning career achievements: winning and holding the Kisei title from its inception in 1977 to 1982, 6 consecutive years (from the age of 51 to 57). Already by 1980, nobody thought anyone else but Fujisawa would hold the Kisei. But in 1983 it was finally wrestled away by the top young player, Cho Chikun. Fujisawa won the first 3 games, controlling each and every move Cho made. It looked like Fujisawa would hold the Kisei for the 7th year in a row, but Cho fought back and won 4 games, culminating in Fujisawa making a blunder from a winning position in the seventh game. This series exemplified his famous direction of play and fuseki skills and at the same time his infamous habit of mid to late-game blunders. After his run of consecutive Kisei titles, the Japanese Nihon Ki-in awarded him the title of Honorary Kisei. Getting late in his years, Fujisawa wouldn't win another big title until the 40th Oza in 1992, where he played another young top-player, Kobayashi Koichi. He went on to hold the title for two years at the ages of 66 to 67, making him the record holder for the oldest player to defend a big title (a record that still stands to this day). In October of 1998, he decided to retire from the go world at the age of 74. The following year, Fujisawa was expelled from the Nihon Ki-in for selling unsanctioned rank diplomas to amateurs in protest against what he considered improper Ki-in policies. In June, 2003, the dispute was resolved and Fujisawa was reinstated in the Ki-in. His last place of residence was Kawasaki City. Fujisawa passed away on 8 May 2009 at 7:16am in a Tokyo hospital of pneumonia. According to Mrs. Guo Juan, Fujisawa-Sensei went to China every year to teach, bringing his students, beginning in the early 1980s. At first he used his own money, later acquiring sponsors. Fujisawa's name was originally Tamotsu (保), but he changed it to Hideyuki in 1943. The characters for "Hideyuki have the alternative reading Shuko by which Fujisawa was often known. The character shu (秀, shū) is the same as the one in many Honinbo names, such as Shuwa, Shusaku, Shusai, Shuei. On the other hand when the Yomiuri Shimbun published the games from the first five Kisei matches (that earned him the title of Honorary Kisei - Meiyo Kisei), they titled the book Fujisawa Hideyuki Meiyo Kisei e no Michi More about pronouncing his name on /Discussion. The definitive information about his name comes from the master himself via an interview published on the New in Go website here, article number 72. The genius of the greatest blunderer.